This Saturday marks the start of month three of my Nutritional Therapist studies with the Nutritional Therapy Association. 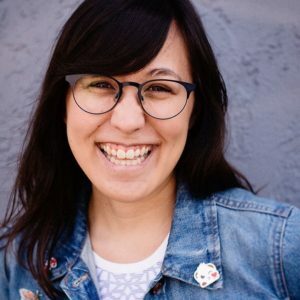 I have learned a lot in the past two months, and I can’t help but see so many things in a different light and am looking at in my life and diet. All native peoples that thrived ate animal protein. Weston A. Price, a dentist, decided to study the dental health of native peoples around the world in the 1930s. In his travels, he discovered that those still eating their native diets and not a Western diet of refined foods had straight teeth! Like the kind of teeth some of us struggle to have after years or orthodontia. Also, that those diets had some kind of animal protein, even if it was insects a few times a year. It’s made me think of adding a little more animal protein in my diet and with each meal, as healthily as I can (ethical and sustainably raised/farmed meat and seafood is still at the top of budget). Your body is in one of two states at all time: parasympathetic or sympathetic. One of them is better for digestion than the other. The sympathetic state is what we’re usually in, it keeps homeostasis going and is also where the fight or flight triggers and reaction come from. The parasympathetic state is nicknamed the “rest and digest” state, and is optimal for digesting your food well. When we’re in the sympathetic state and eating, it can make digesting difficult. 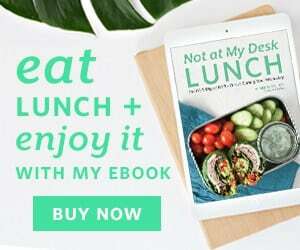 I’ve heard suggestions for a few years to not be distracted while eating, but learning that your body needs to be in a different state to digest has made me more aware of what my environment is like when I’m eating. I try to take more deep breaths, be more aware of putting my fork down and not just going to town on my food, and I’m trying not to eat with distractions anymore. Completely by chance, N and I didn’t watch a tv show while eating at home (that’s usually our TV time) and we really liked just talking to each other and being together. So we stopped watching tv at dinner and can focus more on eating and being present together. All the nutrients you absorb (that you can’t make) are absorbed during digestion. So if you’re not eating well, eating too fast, or not eating enough, you’re literally not giving your body what it needs to operate! Digestion is a much bigger deal than I’ve ever thought before. For me, this has been slowing down again, making sure my food is more throughly chewed. I’ve always been a fast eater, and I can see now how much that isn’t helpful for your body. Your mouth and the saliva in it is the starting point for breaking your food down into smaller pieces and molecules that as the digestion process continues, continues to get reduced down to smaller molecules our body can use. If the molecules are too big, our body can’t digest and use them properly. Our bodies were made to run on fat for fuel, not carbs. Carbs are a good source of quick energy, but if you want some lasting energy, eat some quality fats. If you’re constantly eating carbs for a quick hit of energy, your blood sugar is also going to spike up and down as your body eats through it. This leads to the energy crashes, lots of snacking and people grabbing coffee in the afternoon. I’ve been looking at my meals and snacks (especially my snacks) and looking at my choices. Is there enough fat in this meal/snack? Do I need to add something to feel more full and also to not crash in a few hours? I’ve started to add some nut butter or almonds to my snack of a piece of fruit, or making sure there’s something in my meal that’s got some fat and protein to keep my source of fuel as even as possible. Prolonged stress can really affect your health. I’m reading through a really fascinating book as an assignment right now, Adrenal Fatigue: The 21st Century Stress Syndrome by James L. Wilson, N.D., D.C., Ph.D. As I’m learning more about the adrenal system and the hormones it produces and how much your body needs those to function, it’s making me think more about how to take some stress out of my life. Constant stress is not only exhausting to feel, but it can also compromise your adrenals and limit the hormones they produce, which can affect your blood sugar regulation, how carbs and fats are used in the body, converting fats and protein to energy, cardiovascular and digestive functions. Reading this and continuing to dive into this book and learn about adrenal fatigue makes me more dedicated to continue practicing yoga, making mediation more of a practice, and keep looking and what I can say no to so I can say yes more to a less intensely stressful life. There are also a lot of suggestions on how to structure your meals for a more nutrient diet, which is something I’m working on wrapping my brain around. I’m much more of an intuitive cook, I combine things that sound good to me knowing I need a vegetable and some fat or protein, but I’m never super strict on quantities or ratios. I usually just make what sounds good and feels good. 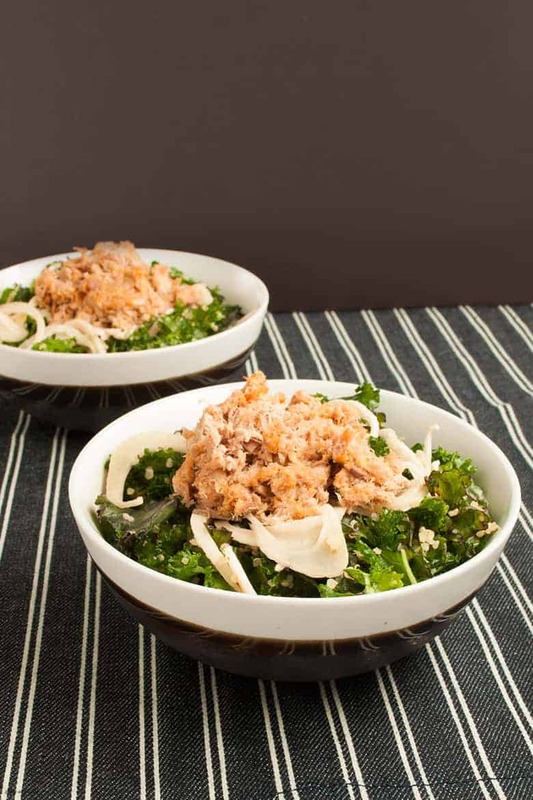 This Massaged Kale Salad with Tuna and Pickled Fennel was made for an assignment and taking their ratios of carbs to fats to proteins in mind. Their whole food diet also encourages lightly cooked or raw vegetables, as well as more fermented foods. In looking at my diet, I realized I cook a lot of my greens, so I made a massaged raw kale salad as the base of this meal. Massaging the kale with olive oil helps break it down a little bit and helps people get over the roughage feeling that truly raw kale brings. Also, when you eat greens with healthy fats, you can better absorb the nutrients of the greens. I quick pickled some fennel to add some fermented veg, crunch, and a nice tang. I’ve got quinoa in here, but a lot less than I would if I made a quinoa salad. I wanted some whole grain carbs for fiber, and quinoa also has a good amount of protein. 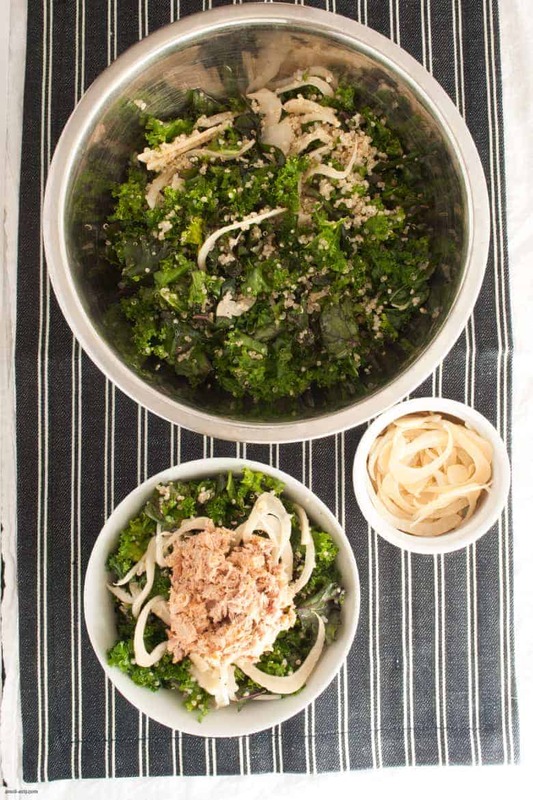 To add some animal protein and healthy fat, I finished this salad with a tahini tuna salad. Using tahini instead of mayo (mayo isn’t really my jam) adds healthy fats without any question of what kind of oil in the mayo (not all oils are created equal, my friend and also Nutritional Therapist Beth has a great article about it), as well as adding additional protein. I grew up eating canned tuna, but after learning about how it was hurting other sea life, I cut back on my canned tuna consumption. Last year I found Safe Catch Tuna, which is sustainably caught, lower in mercury, and cooked in a way that retains more nutrients and Omega 3s than other tuna. They’re also partners with the Monterey Bay Aquarium Seafood Watch, the leaders in sharing which seafood is safe and sustainable to eat. They’re not a sponsor, I’m just glad to eat tuna that’s safe for me and for the ocean. If you want to make this meal your own, you can pickle another in season vegetable: carrots, cauliflower, parsnips, beets, make or add your own sauerkraut. You can swap the kale out for Swiss chard, spinach, or another lettuce mix that suits your fancy. Not a fan of tahini? Swap it out for full-fat yogurt, avocado oil mayo, or a ripe avocado. Did anything I learn surprise or intrigue you? I’m so excited to learn more so I can share it with you! Combine vinegar, water, sugar and salt into a small sauce pot and bring to a boil or until the sugar and salt are dissolved. Pack a mason jar with the thinly sliced fennel. Once salt and sugar are dissolved, allow to cool for 5-10 minutes, then pour into the mason jar with the fennel and allow to cool. You can do this the day of or a few days ahead, if you have time. In a large mixing bowl, add kale, olive oil, lemon juice, and salt. Massage kale with your hands for 3-5 minutes until kale shrinks in size slightly and is softer. Add quinoa and at least half of the pickled fennel and stir to combine. 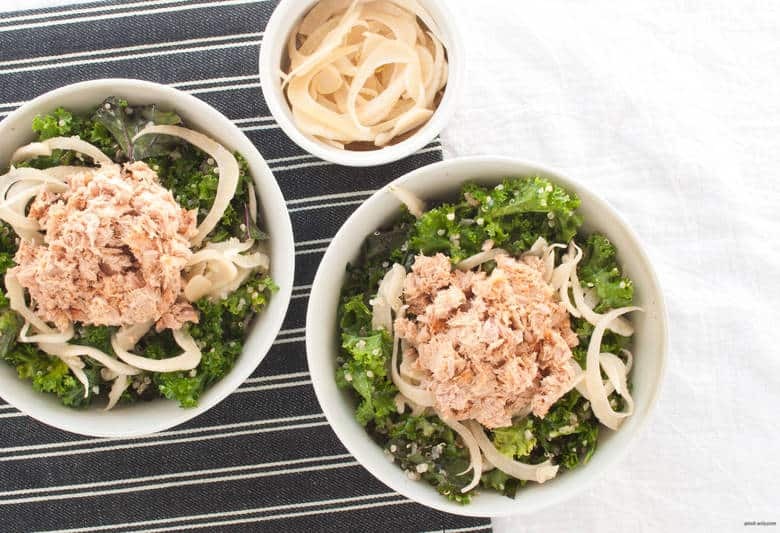 In a smaller bowl, break down tuna with a fork, then add in tahini, lemon juice, and seasonings. Stir to combine and add more tahini if you want a more moist tuna salad. Adjust seasonings to taste. 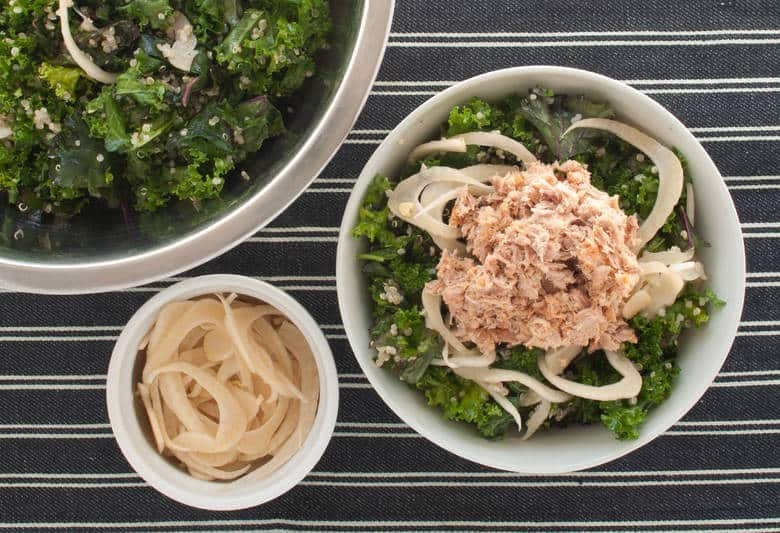 Portion the kale salad into bowls, top with any additional fennel and tuna salad. Pickled Fennel Recipe adapted from French Revolution Food.